Chael Sonnen is the planet’s best middleweight. If you don’t believe me, just ask him yourself. Whether you opt to actually heed the top contender’s claims is up to you, but it’s undeniable the part-time realtor is MMA’s most entertaining trash talker. Thankfully, ESPN decided to put another mic in front of the chatty challenger on Wednesday’s edition of SportsCenter. As expected, Sonnen was spitting hot fire once again. In the latest installment of Sonnen’s comedy tour, the one-time political hopeful alerted the world that he offered the middleweight king an out, however the champ chose not to withdraw from their highly anticipated bout. 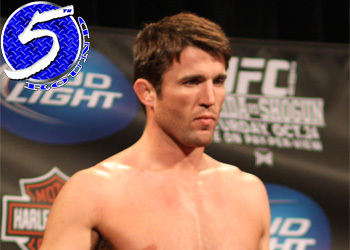 “I gave Anderson Silva every option to pull out of this fight,” Sonnen claimed. “The deadline was last Sunday, he did not meet it and now we’re gonna go to war. The two will do battle this Saturday at UFC 117 inside Oracle Arena in Oakland, California. The live pay-per-view broadcast starts at 10PM ET/7PM PT.